Plus, save up to $200 per couple on Scheduled Air Packages with promo code HAPPY319! Whether you're looking for a relaxing retreat or a thrilling getaway, the island of Aruba truly offers everything you need for a one-of-a-kind vacation experience. Book your stay at this gorgeous island paradise by March 28, 2019! Perfect for weddings, honeymoons, and family vacations, this inviting destination offers a large assortment of things to see and do. 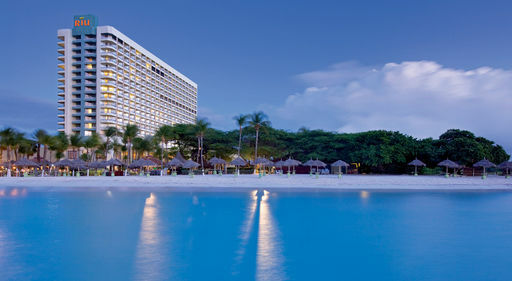 For more exciting information about Aruba, check out our CarryOn blog! Includes Complimentary WiFi and a hotel savings up to 25%! Based on double occupancy, includes gov't taxes & fees. Price is per person from Chicago O'Hare on Spirit Airlines. Travel (WE) May 15, 2019. Price will vary for other departure cities. Enjoy a daily activities program, a casino, and more! Try your luck at the Stellaris Casino, Aruba's largest casino with over 500 of your favorite slots, tables, and more! Based on double occupancy, includes gov't taxes & fees. Price is per person from New York JFK on jetBlue. Travel (FR) Jun 14, 2019. Price will vary for other departure cities. Spend your day enjoying gourmet dining, non-motorized watersports, and a fitness center! Features evening shows, live music, and a discotheque! Based on double occupancy, includes gov't taxes & fees. Price is per person from New York JFK on Delta Air Lines. Travel (TH) May 30, 2019. Price will vary for other departure cities. Enjoy theme nights, carnival shows, and supervised programs for children! Based on double occupancy, includes gov't taxes & fees. Price is per person from New York JFK on jetBlue. Travel (MO) Jun 17, 2019. Price will vary for other departure cities.